The Rockets’ talented big man has been heckled and harangued for shooting too much and from all the wrong places. But after leaving his hometown Hawks and a messy divorce in Detroit, Smith may have finally found a home, and postseason success, in Houston. From the stands, Pete Smith can still hear people complain about his son’s play. He has to restrain himself from responding. He detests the critical comments, the jabs from people who’ve never played the game at an elite level. They don’t know how hard it can be. They don’t know that you need guts to take those shots. They don’t know that Josh Smith is living a dream that’s been transferred from father to son. Ultimately, basketball prevailed as the sport of choice. There was an artistry to it, he thought. Pete Smith could always jump, and he loved to shoot. In college, he became the first black athlete for the Valdosta State Blazers — the cultural significance of which he didn’t fully realize until later in life. His total field goal attempts (721) and rebounding average (13.7) in 1968-69 remain school records. Soon, professional leagues came calling. The Buffalo Braves selected Smith late in the 1971 draft. He played five games for the ABA’s San Diego Conquistadors in 1972, and spent time in camp with his hometown Hawks, though he couldn’t draw a roster spot. He was one of the final cuts on the New York Nets in 1975. Pete Smith believes he was closer than that. There were not many players, he said, who could do what he could with a basketball. Perhaps, he added, he was ahead of his time as a tall player with ballhandling skills. After his hopes of a professional career flickered and dimmed, he returned to Georgia. “Sometimes once you chase a dream, you don’t know when you’ve got to stop the dream,” Smith said. That dream was passed down to his son, Josh. Pete Smith watches most of his son’s games while wearing an immaculate suit and sitting near the court. He’s helped Josh Smith navigate the professional career that never manifested for himself. They’ve been there for one another — each lifting the other up on the path from nothing — ever since the days when Pete drove a truck across the country and Josh hooped in the same ragged shoes he wore to school every day. They’ve seen almost everything during Josh’s career. But neither could have anticipated this season. Throughout his 11 NBA seasons, Josh Smith has blended athleticism with a unique basketball acumen. He’s a skilled passer from the post who can stuff a stat sheet. He leaps like a jackrabbit and can body in the paint. His length and versatility have made him one of the biggest mismatches in the league. But he has also always been more chucker than shooter — a persistent complaint that only grew louder during his lengthy and polarizing stint with his hometown Hawks. But he’s not about to stop shooting now; since Houston acquired him at midseason, he has helped the franchise battle to its best regular-season record since 1996-97. But he had to endure being ostracized before he could get there. In December, the Detroit Pistons made the drastic decision to waive Smith midway through a contract that still owed him $26 million across two and a half more seasons. The Pistons briefly surged after casting aside a player they had signed to lead them out of mediocrity. Smith resurfaced in Houston, where the outcast has been reclassified “a lifesaver” by Rockets general manager Daryl Morey. 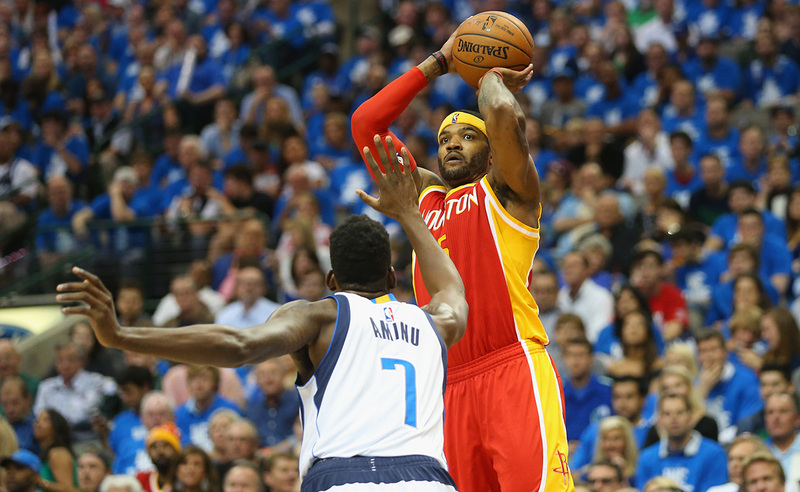 The upside of Josh Smith was on full display in Game 2 of Houston’s first-round matchup against the Dallas Mavericks. If it looked like he and Dwight Howard had a lifelong connection when Smith found the Houston big man for finish after finish over a disheartened Tyson Chandler, it’s because the pair have known one another since they were toddlers. Smith racked up 15 points, nine assists, and eight rebounds in that game. He shot 29-for-52 (56 percent) in the series’ final four games. And with Donatas Motiejunas sidelined for the playoffs, the burden will be on Smith as a versatile wing who can shoot and score down low. It’s been a long road for Smith, though it feels as if his destination is finally in sight. 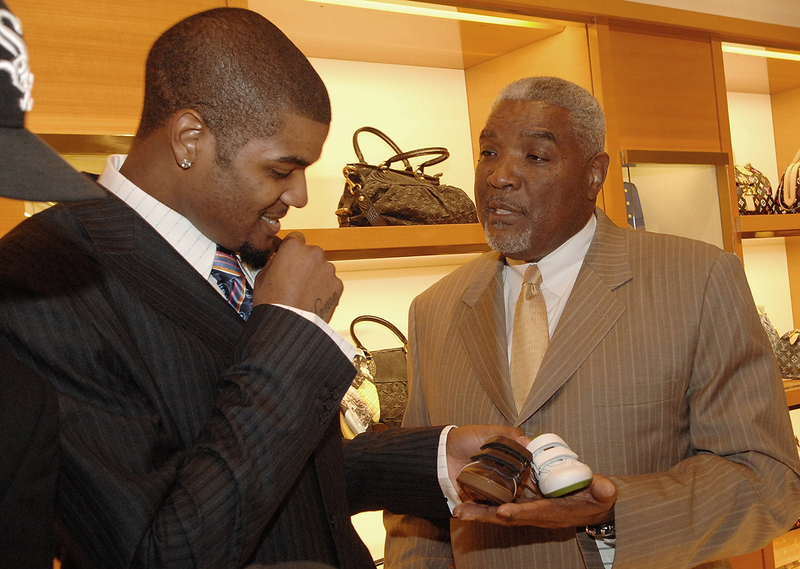 Getty Josh Smith and his dad, Pete Smith, in 2007. Early in life, Josh Smith informed his father that Pete Smith’s dream had become his own. His ability was evident early on. He and Howard formed the backbone of the famed Atlanta Celtics AAU team that also included Randolph Morris and Javaris Crittenton,1 both of whom played briefly in the NBA. Smith, Howard, and Morris comprised about as imposing a frontline as one could imagine along the AAU circuit. They took down a slew of future NBA players in the 2003 Adidas Big Time Tournament, something of a summer AAU championship. Howard had stardom written in his future. Many predicted a lengthy NBA career for Morris. But Smith was arguably the most intriguing of the trio: His potential was limitless. “I’m telling you, you just couldn’t throw it up high enough for him to go up and get it,” said Karl McCray, a cofounder of the youth team. His self-belief, and his penchant for drifting away from the paint, appeared early too. In high school games, Smith was faced with the same dilemma over and over again. He was a smooth 6-foot-9 forward who could drive past, through, and over opponents. It was almost too easy. Defenses clogged the lane, daring and begging him to shoot. So he did. Smith transferred to powerhouse Oak Hill Academy in Virginia before his senior year of high school. He hoped to hone his perimeter skills under coach Steve Smith (no relation). The change presented Pete Smith with a dilemma. Oak Hill had carved out a reputation as a remote place with a focus on basketball development that could push a player to the next level. Still, Josh Smith would be far from home and no longer under his father’s watch. 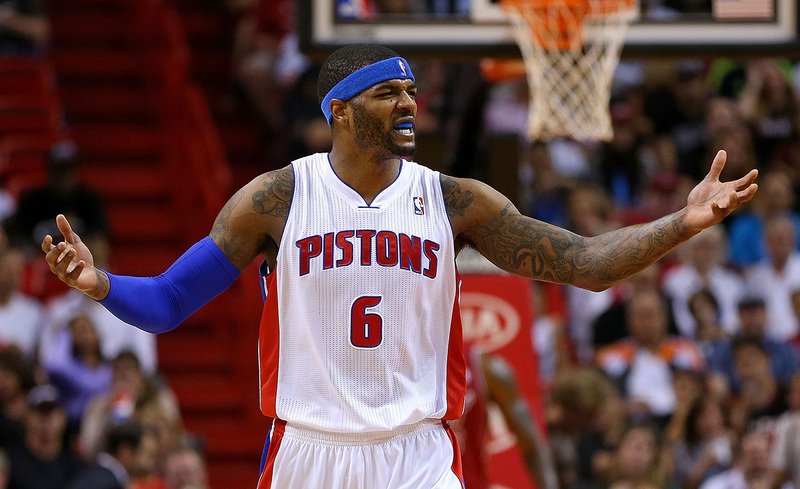 Josh Smith insisted that he could handle his new environment. Steve Smith came to an agreement with his young star. He could work on his perimeter game all he wanted. Steve Smith had long encouraged players to master pull-up jumpers — they couldn’t rely on lazy jumpers and blow-bys in college or the NBA. But he cautioned Josh Smith against settling for outside shots. Once, the coach quickly yanked the player out of the game when Smith hoisted a long jump shot shortly after tipoff. At Oak Hill, Josh Smith teamed with another future NBA star, Rajon Rondo, on a team that went 38-0. Smith averaged 25.8 points, 7.4 rebounds, six blocks, and three steals in his senior season. Josh Smith committed to Indiana relatively early in the recruiting process. He’d forged a close relationship with Mike Davis, then the school’s coach. Pete Smith had also developed a bond with Davis, and liked the idea of a black coach in charge of the program. He wanted his son to play there. But there were no guarantees he’d get to Bloomington — Pete Smith warned Davis that if his son’s stock continued to rise, he would declare for the NBA. Just before the end of the NBA’s prep-to-pro era, Josh Smith submitted his name for the draft. Pete Smith said he wrestled with the decision. “I’m looking at a kid who’s about to get in the arena with grown men,” he said. “He’s gotta grow up fast when that happens. And the lifestyle is something that you have to try and protect him from being engulfed in.” But he knew from his own experience that professional athletes have relatively short careers. In addition to the questions about his talent that caused him to slip, Smith would be starting his career with the expectations and pressure of playing in his home state. The team that he grew up rooting for had been bogged down in years of apathy. The Hawks hadn’t qualified for the playoffs since the lockout-shortened season of 1999, back in the days when Dikembe Mutombo fortified their paint. In the Atlanta sports landscape, the Hawks barely registered compared with the Braves and the Falcons. In Smith, the Hawks had drafted a player some compared to Dominique Wilkins, who had also had major hops and in-state ties. But the Hawks regressed in Smith’s rookie season, finishing with a mere 13 victories. It was Mike Woodson’s first year as head coach, and he played Smith often; he averaged 27.7 minutes — a high number for a player entering the league from high school — and 9.7 points and 6.2 rebounds. That season, he also won the league’s dunk contest with an ode to Wilkins — a windmill dunk while wearing an old-school Hawks jersey. Willis, once an explosive but unpolished force himself, also cautioned Smith about being boxed in as a dunker and athlete while leaving the rest of his game to atrophy. During this time, Smith developed into a player worthy of All-Star consideration. He did a little of everything — score, defend, rebound, galvanize — although most Atlanta fans would argue that he focused too much on his long-range shooting. The Hawks finally made the playoffs again in 2008, but the team never advanced beyond the conference semifinals during Smith’s tenure. He was seldom the offense’s focal point. Woodson gave Johnson that burden. Horford also developed into an All-Star alongside Smith. Meanwhile, the hometown player turned into a polarizing figure. “I really felt bad, because he was so misunderstood by his hometown people, because, sure, he took too many 3s when he was young,” said Billy Knight, the general manager for the Hawks from 2003 to 2008. “He started from the perimeter too much. Because he was so athletic and versatile inside, he could have done a lot more damage inside. But, like most big guys, they like to play on the outside and show their perimeter skills. Smith played nine seasons in Atlanta and placed in the top 10 in nearly every noteworthy franchise statistical category. But there’s one that still rings out in the minds of Hawks fans: 942 3-point attempts on 28.3 percent shooting. Smith also occasionally butted heads with Woodson. In the summer of 2013, Smith inked a four-year, $54 million deal with Detroit. It was the second time Smith had entered free agency as a Hawk. The first time, in 2008, he was restricted and Atlanta matched the offer sheet he had agreed to with the Memphis Grizzlies. By then, Rick Sund had replaced Knight as the team’s general manager, and opted to bring Smith back. This time around, Smith wasn’t part of the Hawks’ plan. 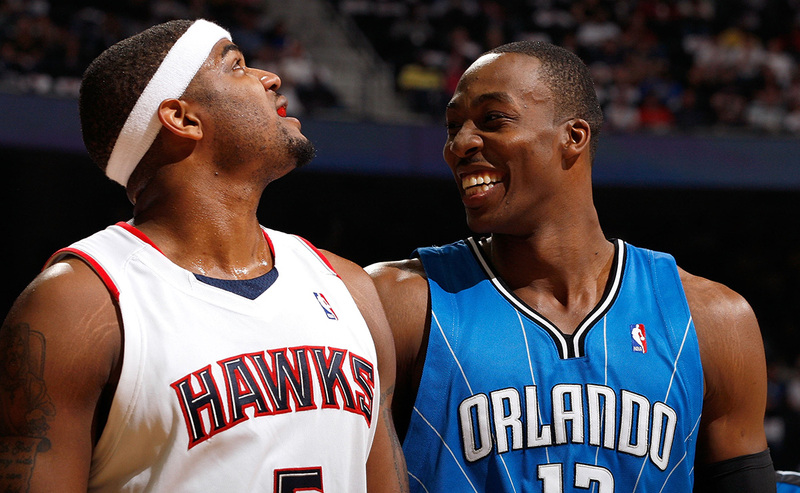 Josh Smith said he doesn’t think about it anymore. Cheeks lasted a mere 50 games in Detroit, amassing a 21-29 record — well below expectations. Detroit won just eight times in its final 32 games. Instead of complementing one another, the triumvirate of Smith, Drummond, and Monroe clogged the paint and proved redundant. The Smith signing was a major reason Dumars was replaced, in 2014, as president of basketball operations by Stan Van Gundy, who was also named head coach. After just 28 games together, Van Gundy decided to waive Smith and his massive contract. Van Gundy said Smith had performed everything asked of him, but that he wanted to offer more playing time to younger players and watch their development, and he thought it would be unfair to ask a veteran like Smith to assume a lesser role on a rebuilding team. They sought trades, but found no more viable option than waiving Smith and using the stretch provision to limit the financial hit on his contract. Detroit caught fire after Smith’s departure, winning nine of its next 10 games. That provided for a tidy, catchy narrative. Instead of answering a question about the impact of Smith’s departure, Monroe remained quiet, his silence speaking louder than his words ever could. Brandon Jennings began playing efficiently with the ball in his hands more often. Smith’s absence allowed the offense to open up. Smith’s removal opened up minutes for little-used reserves and gave young players like Kentavious Caldwell-Pope and the recently acquired Reggie Jackson room to grow in the offense. Still, the team struggled badly in the latter half of the season. Detroit cooled off after Jennings sustained a season-ending ruptured left Achilles tendon, and the team missed the playoffs. Smith, meanwhile, is still playing. After he was waived, he had his choice of suitors — from Sacramento and Dallas to the Clippers and Houston. “We probably would have never thought that this would have happened,” Smith added. Smith produced 21 points in his Houston debut, a win over the Grizzlies. He started the next four games (three of them losses) before asking coach Kevin McHale to come off the bench. The request was at odds with an earlier report that Smith would only sign with a team on which he could start. Smith and Howard’s union was a long time coming: The Rockets had first tried trading for Smith when they signed Howard in 2013. And Smith was already indebted to the franchise’s greatest star — he was one of the first players tutored by Hakeem Olajuwon, whose post-moves camp has become a summer pilgrimage for several players. Houston’s offense relies on 3-pointers instead of long jumpers,5 which has raised Smith’s game. And the team’s spacing has given him the right opportunities, not just any old opportunity. His improved perimeter shooting jumped Smith from the 13th percentile in overall half-court points per possession in Detroit (.710) to the 34th percentile in Houston (.813), according to Synergy Sports. In Detroit this season, 9.5 percent of Smith’s field goal attempts were 3-pointers, and he shot 24.3 percent on them. In Houston, 32 percent of his attempts were 3-pointers and he shot 33 percent. And while Smith’s shooting has improved, he showed against Dallas that he remains one of the game’s best passing big men. Pete Smith said he has also noticed a significant change in his son. As for his father, Pete Smith can take pride in a realized dream, one generation removed. “I’ve got a wonderful kid,” he said. “I call him a kid, but he’s a young man. I’m a blessed man to have Josh Smith as my son and when I say that, I really mean it affectionately. My son is amazing. I’ve really got a good kid, man. The former point guard recently pleaded guilty to manslaughter (after originally facing a murder charge) in the shooting death of an Atlanta woman. Shaun Livingston, Robert Swift, Sebastian Telfair, and Al Jefferson. Although the unfortunate selection of Shelden Williams was sandwiched between those pickups. Smith’s best shooting season, 2009-10, was also his most statistically anomalous: He attempted just seven 3-pointers — missing all of them — but shot above 50 percent from the field for the only time in his career. Smith’s total shots from 16 feet to the 3-point line dropped from 26 percent in Detroit to 6.2 percent in Houston.